The good housing growth story. 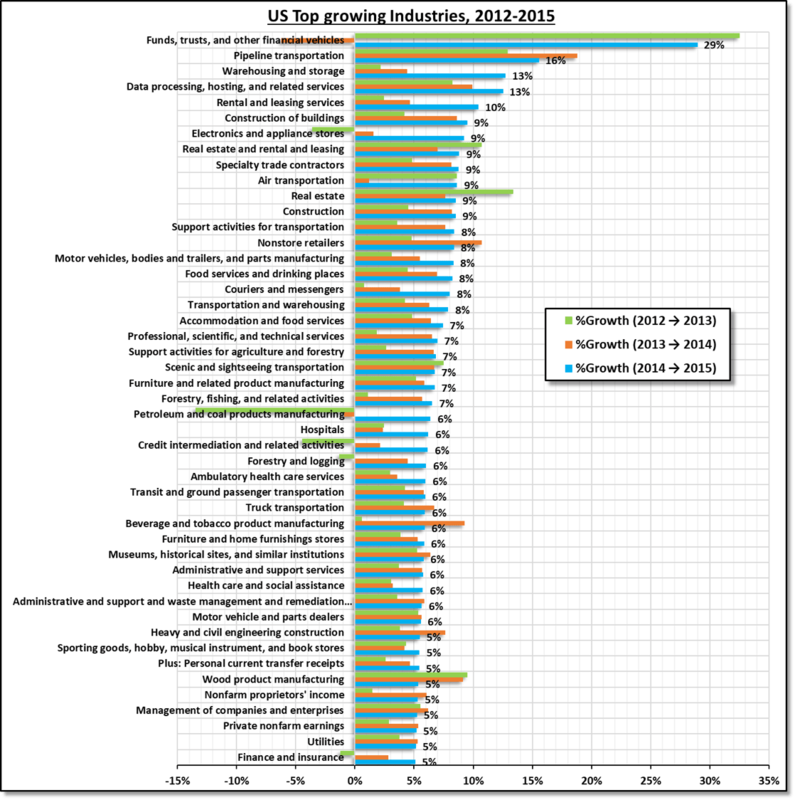 Top US industries by growth, 2012-2015. Data from Bureau of Economic Analysis shows the growth in US markets has been led by housing and real estate, with half of top 12 growing areas related to these fields. Although growth is very uneven across the country, but most areas have recovered to pre-housing crisis highs. The boom in stock market has been the top performer in two out of past three years. With record low oil prices, the old & gas industry has seen unprecedented storage & pumping of gasoline through the well established pipeline network has been second top performer with steady growth. The dawn of e-commerce wars have generated miles of extra warehousing and has been the third top performer. Cloud based services and data storage have seen a sharp rise in recent years mainly due to growth in cloud computing, fall in storage prices, and a boom in datacenter industry. Although stock market has boomed, the financial industry hasn’t performed as well due to heavy regulation by the Obama administration after the 2008 financial crisis. It has been the worse performer in this list of 47 industries, at lower than the highly regulated utilities market.